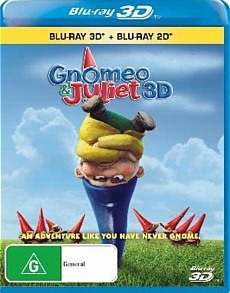 Gnomeo & Juliet 3D Blu-ray Review With more Hollywood voices than you can poke a stick at such as Ozzy Osbourne, Dolly Parton, Gnomeo and Juliet is a fun movie that thankfully doesn't take itself too seriously as it allows you to get lost in this cute and comedic story. 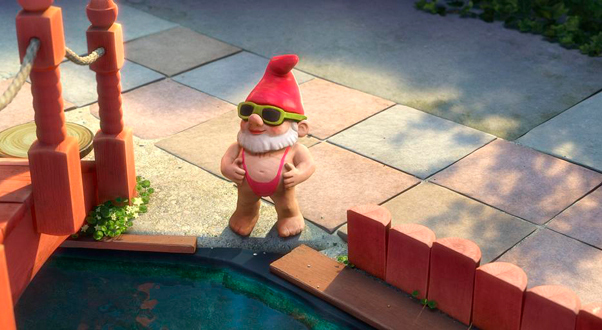 Before I get to the crux of the review, I need to make a special mention about the dazzling animation and video quality of Disney's Gnomeo & Juliet. The transfer to Blu-ray is quite spectacular with larger than life colours and exceptional picture quality. The animation is of course the star of this presentation and even these gnomes who are quite animated and lifelike in the movie still look like their real world counterparts with the texture detail of the clay that they are built from. 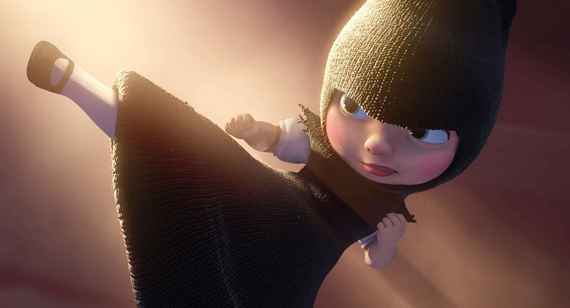 Unfortunately the 3D effect of Gnomeo & Juliet is not as strong as other 3D movies and although there is some good depth perception here and there, it does need some more standout moments. Nonetheless, it's a very impressive presentation thanks to its 1080p presentation on Blu-ray. But enough of the video, what about the story? 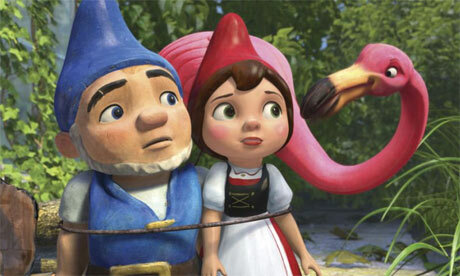 Based on the William Shakespeare tragedy of Romeo and Juliet, this clever modern interpretation revolves around the world of gnomes and just like the aforementioned story, the central element of this story is the forbidden romance between Romeo and Juliet but in this case, it's Gnomeo (James McAvoy) and Juliet (Emily Blunt). Unfortunately both Gnomeo and Juliet live in words apart until one day they have a chance encounter and fall deeply in love with each other but the question is, will there relationship mimic the ending of the original Romeo and Juliet? Directed by Kelly Asbury (Shrek 2), he helps create a truly magical experience that is matched equally by the awesome voice acting of all involved, especially McAvoy and Blunt as the story swaps between the two houses where the gnomes live. Gnomeo lives with the blue gnomes who are led by his mother Lady Blueberry (Maggie Smith) and Juliet lives in the opposite home, the reds who are led by Juliet's father, Lord Redbrick played brilliantly by Michael Caine. Both the blues and the reds despise each other after a generation of warring. The only time that the gnomes meet is on neutral grounds in order to race each other on lawn mowers as Gnomeo versus the arrogant red, Tybalt who is voiced perfectly by Jason Statham. Tybalt is considered the bully of the reds. However when Juliet and Romeo accidentally meet during a chance encounter where Juliet attempts to steal a blue orchid, the two immediately fall for each other. As they sneak away from their two houses day after day, they soon discover love and a friend called Featherstone (Jim Cummings) who is a lonely and comedic plastic Pink Flamingo. However just like the original tale, things soon begin to fall apart for this love struck couple but will the words of Bill Shakespeare (Patrick Stewart), a statue ring true for Romeo as his world beings to fall apart? Of course not, this is a Disney movie but with that said, there are a few scary scenes in this movie, especially when one of the gnomes is smashed against a brick wall. Even with the sometimes darker elements in this movie, Gnomeo and Juliet is definitely a family movie and contains action, drama, humour and more importantly a touch of romance in this feel good movie of 2011. The special effects are a little on the light side but some of the alternate and deleted scenes are quite interesting as is the small featurette with Sir Elton John. They are definitely worth checking out... even the music video. With more Hollywood voices than you can poke a stick at such as Ozzy Osbourne, Dolly Parton, Gnomeo and Juliet is a fun movie that thankfully doesn't take itself too seriously as it allows you to get lost in this cute and comedic story.